Dimple membranes are one of the most versatile and effective drainage products on the market. 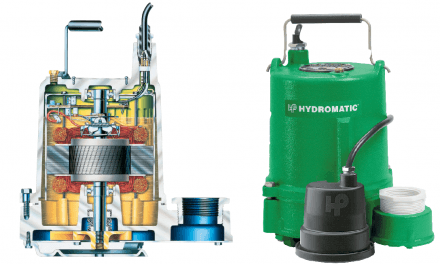 Invented in the mid-1960s, today they are made by more than a dozen different manufacturers, and can be used for nearly every drainage situation imaginable. “It’s just a real good replacement for aggregate drainage layers,” says Mike Kreikemeier, president of JDR Enterprises, manufacturer of J-Drain. Dimpled drain sheets are used on everything from small residential basements to enormous commercial projects extending 50 feet below grade. They can even be used horizontally. 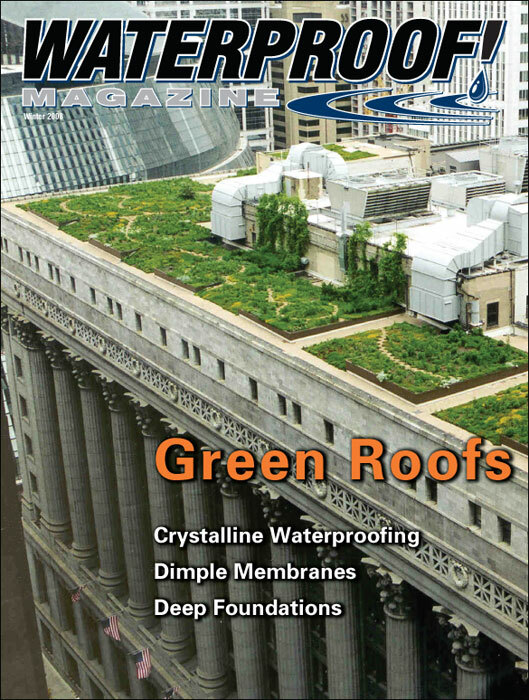 “Our product has been used for green roofs, planters, plaza decks, parking garages, retaining walls, residential foundations, commercial and blindside work,” says Kreikemeier. The key to dimple membranes’ versatility lies in their elegant simplicity. Most consist of a polypropylene or high-density polyethylene (HDPE) sheet, molded into a series of raised knobs, or dimples. The dimple height, sheet thickness, and compressive strength varies between manufacturers. Many have a non-woven geotextile bonded to the dimple side of the membrane that acts as a soil filter, and it’s common for them to be perforated, or “needle punched,” to allow moisture to penetrate. 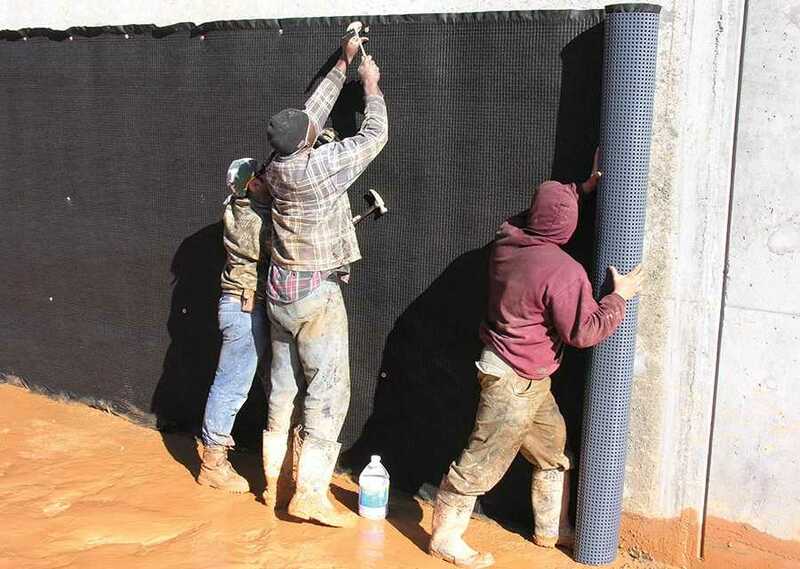 Membranes that have not been needle punched function differently than pervious dimpled sheets, and are often called “air gap membranes.” These membranes typically don’t have a geotextile bonded to them, and can function as a waterproofing barrier. Products of this type include FlexSheet by DMX Plastics, Delta-MS by Cosella-Dorken and Platon by Armtec. 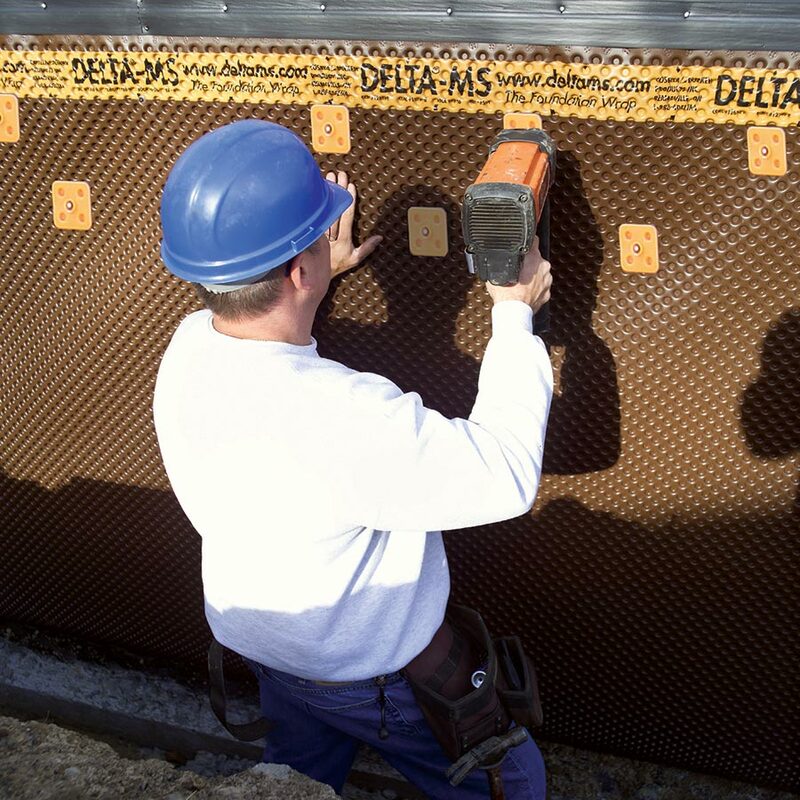 Delta MS and Platon have been certified by the ICC as a stand-alone waterproofing barrier. Air gap membranes have many advantages over other waterproofing materials. 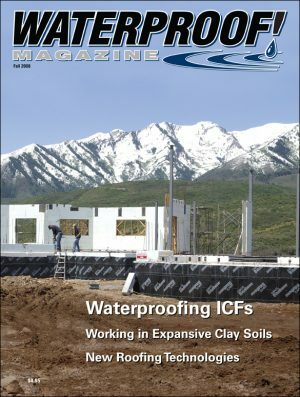 Versatility: For starters, they can easily be installed over virtually any foundation type: poured concrete, concrete block (CMU), insulated concrete form (ICF) or preserved wood foundations (PWF). 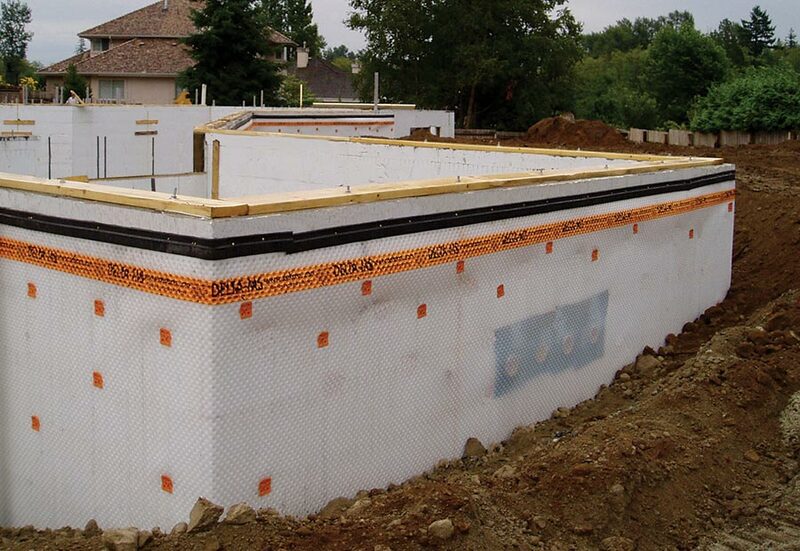 In addition to exterior foundation work, air gap membranes can be used for subfloors, retaining walls, built-up flower beds, around culverts, and other applications. Durability: Membranes are incredibly tough, and will not be damaged during normal backfilling. Additionally, they have an expected lifespan of at least 50 years, perhaps greater than the building itself. Tom Fallon, at Cosella, notes that if the foundation shifts or cracks, as most eventually do, dimple membranes will bridge the gap and continue to provide protection. Construction Speed: You can install air gap membranes as soon as the forms are removed, and backfill almost immediately. Additionally, these products can be applied in any weather. Sustainable: HDPE is safe and environmentally friendly. It won’t leach harmful chemicals into the soil around the home. Installers don’t need special breathing and skin protection. 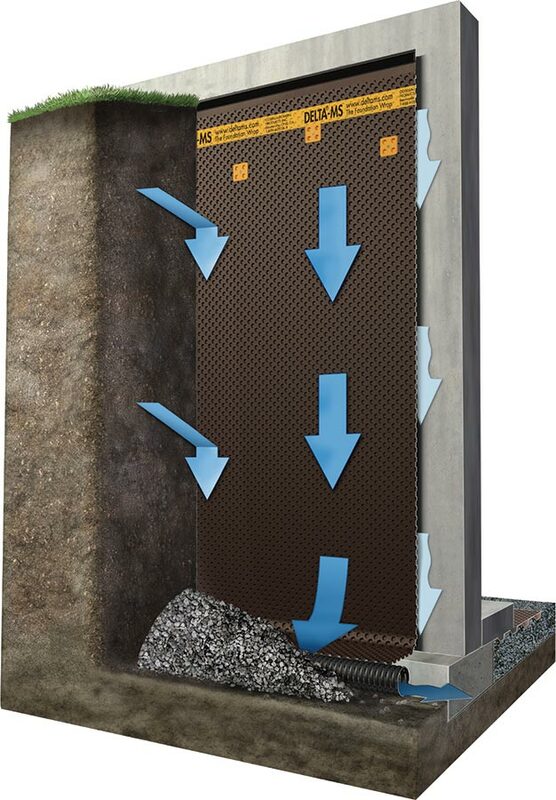 Air gap membranes are installed with the dimples facing the foundation wall. 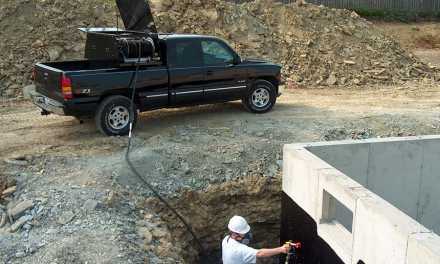 The HDPE sheet is the first line of defense against moisture, directing groundwater towards the footing drain. Any water that gets past the plastic sheet falls freely to the drains. Construction moisture and water vapor from indoors can also condense and flow down to the perimeter drainage. 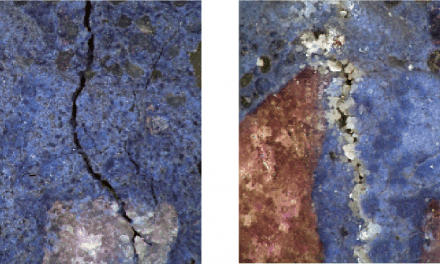 Pieter Greidanus at Armtec notes that impermeable dimple membranes are a great choice for retrofitting damp basements, especially when excavating isn’t feasible. The dimple membrane is installed on the inside between the foundation wall and the interior furring strips, effectively stopping the moisture. 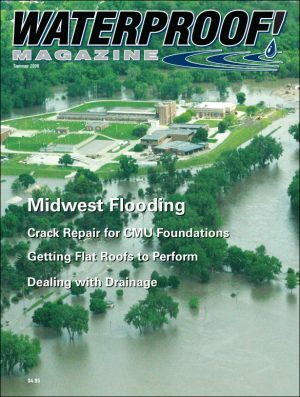 “Depending on the severity of the issue, interior footing tiles may also need to be installed leading out to daylight or to a sump,” he says. Greidanus notes these products can also be used as an underslab barrier, keeping water vapor and other gasses, such as radon, outside the building envelope. Needle-punched dimple membranes are also used in a wide range of applications, and have a number of advantages. The key difference is that they function purely as a drainage layer and need another product to act as the waterproofing course. 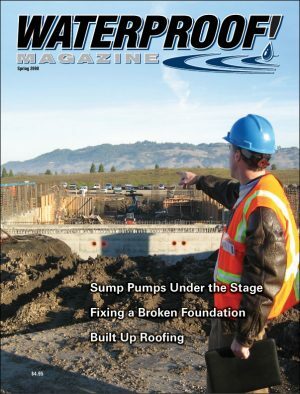 In addition to J-Drain by JDR Enterprises, other common brands include Cetco’s AquaDrain, American Wick Drain’s Amerdrain, Tremco’s TremDrain, MiraDrain by Carlisle, and Geomat by Mar-Flex. 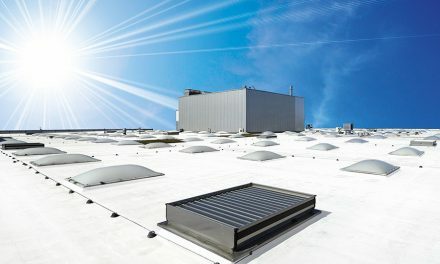 These membranes are popular for both vertical and horizontal applications. Unlike air gap membranes, however, perforated drain sheets are installed with the dimples facing away from the concrete. A geotextile bonded to the dimples keeps soil out of the drain space. Dimple drain boards can move a tremendous amount of water. Flow rates are usually between 15 to 20 gallons per minute per linear foot of product. Horizontal Applications: The fact that a thin membrane can move water so efficiently is a major advantage when horizontal drainage is needed. Instead of using inches of gravel, dimpled sheets can perform the same function in a fraction of an inch. For applications such as plaza decks and parking garages, the product is installed over a waterproofing layer dimple side up. Then the final surface is installed over the geotextile. When water penetrates through the pavers or cracks in the concrete deck, the drainage membrane directs the water to floor drains within the slab. Dimple membranes typically require some sort of specialized fastener to mechanically attach them to the substrate. Horizontal applications that involve vegetation are usually installed with the dimples facing down (see Green Roofs on p.14). Installed under golf greens, athletic fields, planters or green roofs, the dimple “cups” act as a water retention layer during dry spells, while excess moisture falls through the perforations and is channeled to drains. Usually, a separate geotextile is installed over the open dimples to keep soil out. Vertical Applications: Perforated drain sheets share many of the same advantages air gap membranes enjoy. They’re versatile, durable, environmentally-friendly, and easy-to-install. Perforated dimple sheets are commonly used for blindside work and tunnels, where gravel isn’t an option, and for heavy-duty commercial applications where flow rates and compressive strengths exceed the capabilities of air gap membranes. J-Drain, which has some of the deepest dimples on the market—a full inch deep—also has a remarkable compressive strength of more than 40,000 psf. Kreikemeier, president of the company, says it has been used on projects more than 50 feet below grade. In vertical, below-grade applications, a “termination strip” must be attached to the top edge of air gap membranes to prevent water infiltration. The membrane in this photo is made from clear HDPE to make it easier for workers find the furring strips in the insulating concrete forms (ICFs) that this foundation is made of. 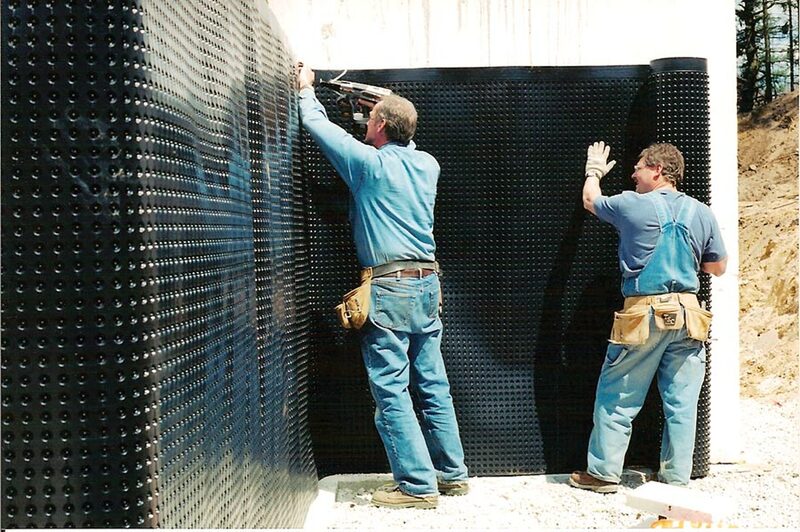 Whether they’re perforated geo-mats or simple air gap membranes, dimpled drain sheets are one of the most versatile and effective drainage products on the market today. Both types of products have been used for projects ranging from small residential basements to complex garden roof assemblies. They typically come in rolls; four feet by 50 feet is the most common size, but some products can be ordered in rolls up to 12 feet wide, and in increments to match common basement heights. Air gap membranes typically cost less per square foot than perforated dimple sheets, since they don’t have the added expense of the bonded geotextile, but both types are proven, cost-effective performers. You’re likely to see one on your project in the future.